With the SE 850 Z PV, SENTECH has designed an UV-VIS-NIR spectroscopic ellipsometer for photovoltaic applications. The spectral range of 300 nm up to 1,600 nm is provided for measurements of optical constants on AR coatings and passivation layers in the whole sensitive spectral range of textured silicon solar cells. The first SE 850 Z PV system has been installed recently and is now in successful operation at SHARP Corp. in Katsuragi, Nara Prefecture, Japan. The SE 850 Z PV extends the standard configuration of a SE 800 PV — a high performance ellipsometer characterized by both fast data acquisition and full spectral resolution including solar probe option for the characterization of textured mono- and multicrystalline silicon solar cells. 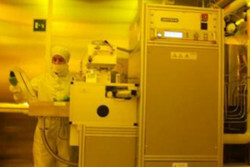 It incorporates a highly sensitive CCD array detection system in the UV-VIS range and a diode array in the NIR. That allows for fast measurements even at low light levels. Multi-angle capability and correction for depolarization effects are further unique features of the system. Automatic fiber switches enable seamless transition between UV-VIS and NIR spectral range. The setup allows the light of the UV-VIS-NIR source to be coupled into the optical path of the SE 850 Z PV as well as the reflected light to be switched between UV-VIS and NIR detection channel. The measurement set-up for textured wafers comprises collecting optics, sample stages, and SENTECH’s unique depolarization software feature. In ellipsometry thickness and refractive index are measured indirectly by adjusting an optical model of the layer stack to the measured data. So, the optical model of the sample is just a rough description that requires validation. SENTECH has developed an easy-to-use validation assistant to its spectroscopic ellipsometer software SpectraRay/3. The tool gives detailed instructions to the user how to improve the optical model. Its simplicity requires no additional input—the user easily runs the tool and reviews the instructions given in the report. The validation assistant works by assuming typical accuracies for matching theory and measurement as well as for sample alignment. It calculates the precision of the model including all parameters. In a second step, the error bars for the involved fitting parameters as well as the thicknesses and refractive indices are evaluated. In the picture, a typical report is given as example. The green color indicates that thickness and absorption index can be measured at expected accuracy. However, the model uses two parameters which are cross-coupled and therefore increase calculation time unnecessarily (see red marks). To improve the model, the user simply has to follow the recommendations given next to them to get a stable model. SENTECH has delivered a spectroscopic ellipsometer SE 850 E equipped with four different stage options. The measurement system went to the Centre of Polymer and Carbon Materials of the Polish Academy of Sciences (CMPW PAN) in Zabrze, Poland. (1) The temperature range of SENTECH variable-angle liquid cell (see previous news) developed for the Institute for Chemistry and Biochemistry at Freie Universität (FU) Berlin has been shifted to a range of +5 °C up to +40 °C. (2) Furthermore, an INSTEC temperature cell is provided for wider temperature control of the sample. The heating unit with water counter cooling enables temperatures up to +600 °C. Liquid nitrogen cooling decreases the sample temperature down to -190 °C. (3) SENTECH’s fully featured automatic alignment option (see previous news) for spectroscopic ellipsometers allows for fast and easy automated sample alignment in height as well as in tilt. It includes the auto-focus option plus auto-collimating telescope and motorized actuators for detecting and compensating tilting angles. The alignment option is combined with manual rotating stage and manual x-y stage. Therefore, anisotropic samples can be analyzed as well. (4) At last, a transmission holder is provided with the spectroscopic ellipsometer. Like the other options, it is designed modularly allowing for easiest table exchange by quick lock mechanism. Fast and easy automated sample alignment—not only in height but also in tilt—is realized by SENTECH’s new fully featured automatic alignment system for spectroscopic ellipsometers. The new auto-align option extends the existing auto-focus comprising a z-stage and a video camera by an auto-collimating telescope and motorized actuators for detecting and compensating tilting angles. An automatic switch between microscope mode (for sample surface height) and auto-collimator mode (for sample surface tilt) enables very quick alignment processes of less than 2.6 seconds. The height and tilt system is controlled by the alignment module of SENTECH spectroscopic ellipsometer software SpectraRay/3. The option is suitable for measurements on all plane samples, even on transparent samples. It is recommended especially for the mapping of samples with slight bow due to layer tensions. Here, alignment of height and tilt is required at every point of the sample. Furthermore, the system may be used not only to adjust the tilt, but also to measure sample bendings. Compared to laser adjustment techniques, the new auto-align method is much less sensitive to surface roughness, to particles on the sample, and to structures within the measurement spot. Therefore, the auto-align option is the ideal tool for aligning samples in a general purpose research facility. A new heatable liquid cell was developed by SENTECH Instruments focusing on the requirements of the Institute for Chemistry and Biochemistry at Freie Universität (FU) Berlin. Experts from this institute visited SENTECH Instruments to get practical training at their own device before its delivery. The liquid cell is characterized by three angles of incidence for optimal ellipsometric analysis, a small volume of about 26 ml and a heated sample plate. It has been developed for the special organic research of the Institute, where the reaction between enzymes and surface layers is investigated to detect enzyme-resistant films. A small pump is keeping the liquid in flow to prevent the enzymes from settling down on the layers unless because of chemical reactions. The temperature within the cell can be varied from room temperature up to 70 °C. At the FU Berlin, the modification of the layers is monitored by SENpro, SENTECH’s easy-to-use and cost-effective spectroscopic ellipsometer. The SENpro combines measurement speed with high accuracy of ellipsometric measurements applying SENTECH’s step scan analyzer measurement mode. Plasma deposition and etching processes require highly precise end point detection methods that are optimally adapted to the plasma system in use. On the basis of many years of experience in the field of plasma process technology as well as based on great expertise regarding laser ellipsometry, SENTECH is now in the position to provide plasma process equipment with perfectly matching, in-house developed end point monitoring. First plasma systems equipped with an appropriate end point monitor for in-situ depth control are already in successful operation. The SENTECH monitoring system is designed to detect etch depth and material transitions during the processes. The laser is reflected by the sample in the reactor chamber during the etching or deposition process. From variations of its intensity in dependence of time, material transitions and, thus, process end points are determined. A separate illumination (LED) and a CCD camera are integrated for sample observation and proper adjustment of the laser spot. The additional motorized x-y table allows for easiest positioning above the reactor chamber window. The belonging end point monitoring software displays the camera image as well as the measured reflection signal. Via a simple software interconnection, the signal of the photo diode can be used in the standard SENTECH plasma system software to define end points in etching and deposition recipes. SENTECH has now delivered the first SENDURO® measurement system for 200 mm silicon wafer applications. The system allows the automated measurement of films in the thickness range between a few Angstrom and more than 50 µm. A robot loads the wafers automatically from a cassette station. The very fast measurement of each point allows to analyse the uniformity of coatings on 200 mm wafers by a multipoint measurement. Please contact us if you want to get more information or a demonstration. The first PEALD system was already set in operation at the TU Braunschweig for the deposition of extremely uniform and dense thin oxide films like Al2O3 and ZnO. For the deposition of Al2O3, TMA (C3H9Al) and plasma generated atomic oxygen ‘O’ were utilized at substrate temperatures from 80 °C to 200 °C. The PEALD films exhibit excellent thickness uniformity and very small variation of the refractive index measured with SENTECH spectroscopic ellipsometers. 2D uniformity plots are shown on the right. SENTECH SenSol Haze is designed for quality control of transparent conductive oxide films in PV manufacturing of thin film solar cells. It is a TCO inspection tool that offers uniformity mapping of film thickness and spectrally resolved Haze H(λ) on glass sheets of all standard glass sizes. Additional sensors for the measurement of sheet resistance, of composition, of optical constants like refractive index, absorption, and band gap are available. Oerlikon Solar, Switzerland, a leading provider of thin film PV manufacturing equipment for the mass production of thin film silicon solar modules, is one of our key reference customers of the SenSol H. Oerlikon Solar uses the SenSol H for mapping the spectrally resolved haze and thickness of TCO layers on glass panels to drastically reduce the system service downtime. Oerlikon Solar recommends the SenSol H as quality control tool to its international customers. The SenSol H comprises the computer-controlled conveyor transport system and the sensor platform for haze, film thickness, and other sensors. The special design of the system allows measurements at every position of the glass sheet, especially at the edges. Glass sheets can be loaded and unloaded manually or by a robot. The spectral generalized magneto-optical ellipsometer SGME© SENresearch combies Kerr spectroscopy, MOKE, and spectroscopic ellipsometry in one easy automated measurement. The SGME© SENresearch is the ideal tool for the characterization of thin magnetic films, multi-layer stacks, multi-ferroic materials, spintronics, magnetic nano-materials, and new magnetic materials with regards to magneto-optical coupling parameters, orientation of magnetization, degree of spin polarization, refractive index, extinction coefficient, and film thickness. SENTECH has developed a two chamber cluster tool for etching of metals, dielectrics, and silicon. The system comes with cassette station for automated batch processing and manual loadlock for single wafer etching. The hexagon transfer chamber allows an installation where only cassette station and loadlock extend into the clean room. Chlorine and fluorine etching processes are separated from each other by the two etching modules. The substrate electrode temperature can be chosen between -30 °C and 200 °C. The system is designed for processing of up to 8 inch wafers and especially suited for applications in research and small scale production (picture shows preparation for 4 inch wafers). SENTECH infrared spectroscopic ellipsometer SENDIRA works with THERMO FTIR (6700). The arrangement combined the high performance IR ellipsometry with FTIR technology. The IR ellipsometer is also available now for the new VARIAN FTIR series. SENTECH launched the new FTP advanced reflectometer RM 2000 with spectral range from 200 nm to 930 nm and micro spot of 100 µm. The RM 2000 is especially suited for the characterization of bulk materials, thin films, and layer stacks by optical reflection measurements. Through a spectral range extension and a reduction of the spot size, the RM 2000 is able to measure the uniformity of AR coatings, filters and composition (GaAIN) in the DUV-VIS spectral range. The instrument is supplied with SENTECH FTPadv Expert software. SENTECH Depolab 200 is our newest system for plasma deposition of dielectric films (e. g. SiOx, SiOxNy, SiNy layers) on single wafers or pieces of wafers. Direct loading of samples, substrates of up to 8 inch diameter, operation at 13.56 MHz, substrate temperature control between RT and 400 °C, optional frequency mixing and end point detection, advanced hard- and software with client server architecture including the well known Windows based SENTECH software for plasma equipment operation are key features of the new Depolab 200 system. SENTECH announces the installation of a SenSol measurement system for the analysis of thin films of thin film solar cells. The multiple sensor platform of the SenSol can accommodate sensors for sheet resistance measurement (4 PP sensor, eddy current sensor, optical sensor), for haze measurement, and for film thickness measurement (reflection and transmission mode).